Serving Middle Tennessee Including Jackson, Clarksville, Nashville, Murfreesboro, Chattanooga, Cookeville, and All Points in Between since 1983. Morgan Reporting has operated its business for 30 years largely through word-of-mouth and repeat business. Our philosophy is to take care of you, the client, no matter how big or small the job, so that you will trust us to do a good job again. Morgan Reporting networks with other court reporting firms. We will treat your client as if they were our own but to your specifications. We use electronic signatures and are happy to send our finished transcript to you for production to your client. Our local conference room is available at no charge. If the Murfreesboro location isn't convenient, let us help you find a location for your live, telephonic, or videoconference deposition. We always offer free condensed copy and index with regular copy; E-tran, PDF, ASCII, hard-copy formats -- whatever you require. We can guarantee a fast turnaround from our experienced court reporters, and we are happy to travel. We also use Skype and other methods of video conference through the Internet. We set up with Polycom so everyone can participate and hear clearly, and we have a videographer available should you require their services. For your convenience, we have a conference call-in number so all parties can connect easily. We utilize Realtimetechnology which allows us to convert stenographic notes quickly into English text. Rough Drafts are available on request. (If you anticipate a daily draft, please ask in advance). 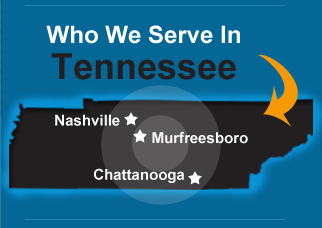 We proudly serve many Tennessee cities including Jackson, Nashville, Murfreesboro, Chattanooga, Cookeville, Clarksville, Memphis, Knoxville and all points in between. We also have a licensed court reporter available to travel to Southern Kentucky. If your location isn't listed here, just ask. We can probably go there; but if not, we network with many experienced and reliable reporters who can. Morgan Reporting has provided quality court reporting services for the tri-city (Nashville, Murfreesboro, and Chattanooga) area since 1983. Morgan Reporting is a Tennessee certified, court reporter owned and operated firm. We provide court reporting services that cater to individual deposition needs. Morgan Reporting prides itself on a reputation of honesty, accuracy, reliability, and responsibility in delivering the finished transcript to the client. We welcome the opportunity to be of service to you and assure that every effort will be made to meet the demands of your court reporting needs. Contact Morgan Reporting to discuss your specific reporting needs.